On accessing the site your festival ticket will be exchanged for a card and a bracelet, strictly one per person. If you lose these, or they are in poor condition you may not be able to enter the premises. Both the card and the bracelet are personal and non-transferable so they must be kept in good condition. Check our website to inform you of the places and times of the exchange. Minors under the age of 16 may enter the show, having purchased a ticket, but they must be accompanied by a parent or tutor. Tutors should bring documentation identifying them as such. All children from 16 years may enter the venue under the same conditions as adults without being accompanied. Throughout their stay at the venue, the accompanying adult will be responsible for all the minor’s actions. Both the accompanying adult and the minor must at all times carry their identity document in order to present it when requested by Festival Organiser to prove their identity. Citizens of other countries must carry the relevant documents from their own country. -If the accompanying adult during the show is the parent or legal tutor: both the child and the guest must present their ID card, marriage certificate, passport or both legal document certifying the parent-child relationship or responsibility for the minor. In addition to the relevant documents, parents or guardians must have a valid ticket. At all times both as the minor and the accompanying adult, must bring their ID or passport so that if requested by the staff of the organization they are able to prove their identity. Foreigners must provide the appropriate documents from their country of origin. Both the authorization of assistance as exculpatory document may be collected and completed at the entrance of the venue. The Festival Organiser points out that current legislation expressly prohibits the sale of alcohol and cigarettes to anyone under the age of 18. Each minor under the age of 18 will carry a bracelet that will mean that they are not able to buy alcohol. The minor shall at all times wear this bracelet visible, and also carry ID. Failure to comply with the above requirements will be grounds for expulsion from the venue and will not give the right to refund of the price paid for the entry of the child. The ticket is incomplete, altered, ripped or shows signs that it may be a counterfeit. The ticket holder behaves violently or publicly incites hate, violence or discrimination based on background, race, gender, faith, personal opinion, disability, sexual orientation, gender identity or any other social or personal condition or circumstance. This also relates to ticket holders who behave aggressively or cause any disturbance outside or at the entrance, anyone carrying a weapon or an object that could be used as such and anyone wearing clothing or symbols or carrying objects that may incite violence or are seen to support activities that are contrary to basic human rights as recognised by Law and the Spanish Constitution. The ticket holder displays any symptoms of intoxication or of taking or having taken drugs or narcotic substances. Go enjoy the festival. Head to the nearest bar and start spending without waiting in top-up queues! The RFID wristband is a wristband with an RFID chip in it that acts as your electronic wallet and can grants you access to certain gates and also acts as your electronic wallet, allowing you to make purchases without the hassle of cash or card transactions. 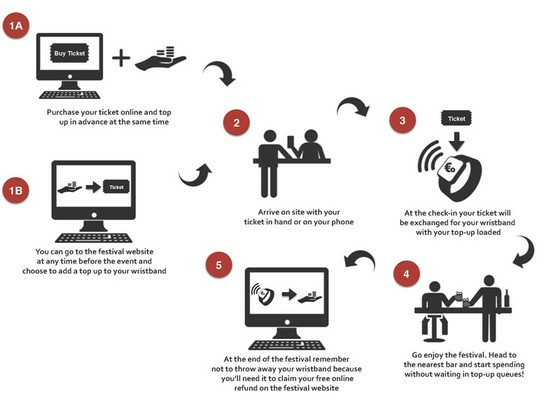 Your RFID wristband is used to access the festival and to pay for food, drinks and merchandise within the gates. After ordering, you simply tap your wristband against one of the readers located at each bar and vendor. Once the transaction is confirmed, the amount is automatically deducted from your wristband’s balance. No. Barcelona Beach Festival is a fully cashless festival, which means that the only way of paying for goods is with your wristband. Don’t worry! You’ll just need the numbers on the back of your wristband, so don’t throw it away after the festival ends! You can ask for your refund until July 26th at 23:59h, and the limit date to receive your refund is August 10th. RFID wristbands present many great benefits to YOU. You’ll save loads of time as RFID significantly reduces queues at vendors and bars. Also, you won’t have to worry about counting and keeping track of cash or waiting for your card transaction to be accepted. It’s also super easy to use! If your wristband is stolen off your wrist (very unlikely) or gets lost (also very unlikely) you can get a replacement. However, please keep in mind that your wristband is similar to cash, if you lose it, you can’t get it back. This means we can issue a new wristband, but your credit will be lost. None of your personal data is stored on the wristband, so don’t worry about that.